Buying a bed online can be overwhelming. There’s a dizzying array of choices, and it seems like new brands pop up every day. Although most of these companies offer generous trial periods and hassle-free return policies, have you caught yourself wondering if there was a way to find your perfect fit with less worry of a return? A way to get it right the first time? Have you ever considered a customizable mattress? In this article, we’ll share a few of the top-rated customizable mattresses and help you determine if this option is right for you. Why Buy a Customizable Bed? This type of bed is one that you can either build yourself by answering a series of questions about your preferences, or it could be something that has different settings or options. 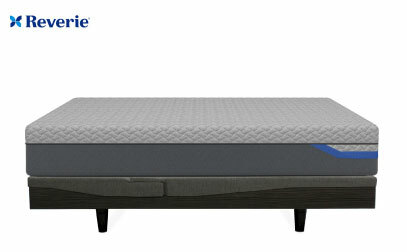 For example, some brands have created beds that you can flip over or unzip to adjust the firmness levels. A bed is one of the most important investments we make in our health and well-being. You already know that we spend more time in bed than just about anywhere else, so it’s imperative that we make that time count. 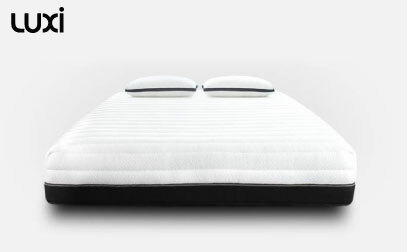 A customizable mattress like the Luxi 3-in-1 can remove a lot of the commitment to feel and compromise between couples that can be a frustrating part of mattress shopping. This brand lets you bring three different mattress experiences into your home where you can try out each and decide which works best. If you sleep with a partner, you can order the bed split in sizes Queen or larger so that they may select their own preferred setting. What stands out? Assuming you go with a split, there are nine different configurations to Luxi mattress that range from a super soft focus on extra pressure relief to a firmer side that’s all about support. All you need to do to change the feel is unzip the cover and flip or reorder the layers within for a brand new experience. One of the layers contains the company’s proprietary Shape Matching Technology made from foam pods that can either collapse under concentrations of weight or conform to your body to support the curves of practically any body shape. If the standard mattress isn’t the perfect fit, the company will work with you for 1000 nights to swap out layers and tailor the mattress just for you. Read more about this model in our in-depth analysis here. Usually, we associate quizzes with stress rather than a better rest, but this is precisely how Helix approaches customization with their customers. By answering a few easy questions about you and your partner’s sleep habits and preferences, you can have a mattress constructed that is based on your exact specifications. Your new bed would either be one blend of features to match you both or a split bed with a distinct feel on each side. What is special about this bed? 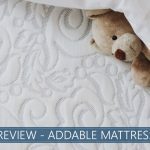 Mattress feels and features can be overwhelming especially if you don’t understand what all of it is and what it means for you and your sleeping comfort. By creating a quiz with the company’s Color Match system, Helix is able to take away a lot of the guesswork and uncertainty that many customers have when shopping for a bed online. Every bed from Helix is a blend of their proprietary materials. Their comfort system includes their specialty memory foam and a dynamic foam that is quicker responding. Their micro coil unit is made from steel and is designed to distribute your weight evenly. If you prefer to get a custom fitting in person, the company does have storeroom space in New York City. 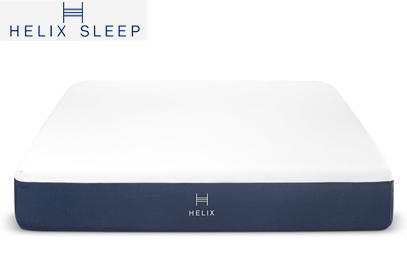 Want to know more about Helix Sleep bed? Find more details here. 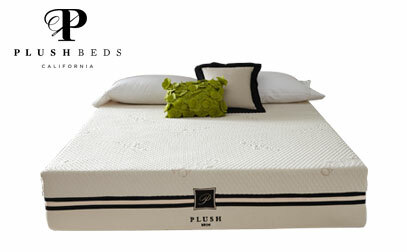 PlushBeds not only offers a more organic sleeping environment, they also give their customers a lot of choices when it comes to the height and feel of their all-natural latex beds. Each Botanical Bliss uses a layer of wool and several layers of organic latex that were processed using the Dunlop method. All of the materials have cleared the industry’s highest standards for natural materials and consumer safety. What is its best feature? 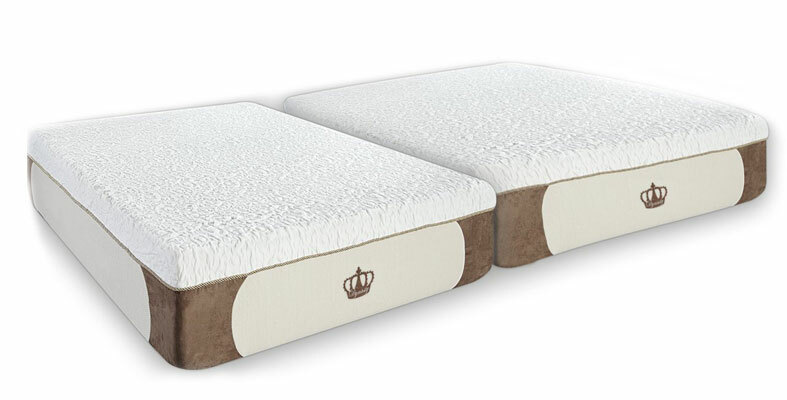 Not only can you choose between three different firmnesses for this mattress, you can choose between three different heights if you want a thinner or thicker mattress. The different firmnesses are Soft, Medium, and Medium-Firm, and which you select will depend on your preferred ratio of soft pressure relief to firmer support. Latex can offer a lot of bounce and is very responsive, which means it should make it easy for you to reposition. This latex is sourced from natural rubber tree sources, and the company strives to eliminate chemicals from their manufacturing process for a more eco-friendly and organic product. The entire bed is wrapped in a flame retardant made from wool that also wicks away moisture, as well as an organic cotton cover. Smart technology is taking over the world, and it was only a matter of time before it came to the mattress industry. ReST® Bed pairs with any smart device you choose, or you can use a Samsung tablet that comes with your mattress purchase so that you can track biometrics and adjust the sleeping surface to achieve your perfectly balanced night’s sleep. What stands out? This bed takes zoned support to the next level with smart technology that can target five different parts of the bed where your body is resting to tailor the blend of pressure relief and support exactly to your shape and weight. These adjustments are made automatically when pressure points are detected by sensors integrated into the product’s construction. The bed also collects information about your sleep patterns and other important information that can help you better understand your sleep habits and improve them for ultimate daytime performance. The app can target those with back pain to potentially improve your bed’s ability to address your pain points, or you can choose to address recovery in order to enhance athletic performance. Read our full overview of the ReST bed here to find more details. The Reverie Sleep system amps up tailoring by creating a mattress where you can pick and choose different firmnesses of your coils and arrange the layout of each coil into your preferred pattern. If that seems intimidating, it shouldn’t be because the bed comes with a special app that can take in data about your shape and weight and show you the best configurations for your body. What’s its best feature? While many beds are designed and locked into a certain feel, the Reverie system allows you to adjust it at home at any time. If your needs change or you just want to try something else, you can open it and reconfigure the foam springs to maximize your comfort. The bed also comes with a 365 Promise that provides you with your own personal sleep concierge that will serve as your own personal sleep assistant. For the first year you own the bed, this consultant is available to help you set or reset your bed for you and your partner. Depending on how hard or soft or eco-friendly a bed you prefer, Nest Bedding may have your solution with their highly customizable Hybrid Latex that offers a blend of the best features of latex and coils. You can choose between standard and organic versions, as well as soft, medium or firm. This company is known for designing high-quality beds that the company stands behind with exceptional customer service. Nest is one of few companies in the business that offer a lifetime comfort guarantee that allows you to swap out your existing Nest mattress for a new one for a percentage of the cost of a replacement. The bed is also covered by a lifetime warranty. What stands out? Those who want to invest in a more organic sleep space may do so, or you may elect for a slightly more affordable option with fewer certifications and a few more synthetic components. If you and your partner have different feel preferences, you may also elect to have the King size bed built with split comfort or distinct firmness levels on either side. Dreamfoam’s reputation is built upon offering higher quality materials at exceptionally affordable prices, and they do so by creating more streamlined designs and reducing overhead costs by selling their products on the internet. 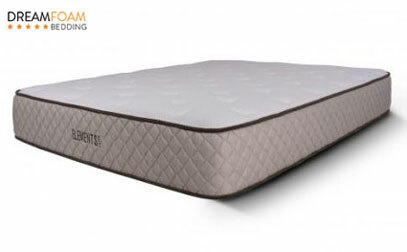 Though it is rare to find customization in the budget-friendly space, Dreamfoam offers it with their Ultimate Dreams Latex bed, which is built to your exact firmness specifications. What stands out? Many mattress companies give you a choice between several firmness options, but Dreamfoam takes that concept a step further by offering a one-on-one consultation with every customer buying their latex bed. After speaking with you over the phone, the company sets to work building your bed so that its firmness is uniquely suited to your individual body and sleep position preference. From temperature regulation to breathability and bounce, latex offers a lot of advantages as a comfort material for your bed, but its cost can be quite prohibitive, especially for higher quality materials. Talalay latex, which makes up the top 3 inches of the Ultimate Dreams Latex, is known to be more consistent and higher end, but Dreamfoam is selling this mattress for a price that is much more accessible than comparable latex beds. If you’re in a relationship, chances are that you and your partner have different thoughts about your bed. This is normal, but it could lead to some arguments. For example, if one person in the relationship is a side sleeper while the other sleeps on their back, they may feel quite differently about the same mattress. The side sleeper likely wants a softer sleeping surface, and the back sleeper could prefer something firmer. Progressive bedding firms survey their customers to find out what positions their customers sleep in. Helix, for example, found out that 73% of their female customers are side sleepers while only 52% of men fall into that category. A side sleeper and a back sleeper can interpret the comfort level of the exact same mattress quite differently. A back sleeper might find that a particular bed is way too soft for their taste, while their side-sleeping partner will think it’s just right. With a customizable bed, in many cases you are able to adjust how each side feels so both of you can be happy on your mattress for two. We mentioned a moment ago that a person’s sleeping position can affect the way they perceive firmness as well as their tendency to prefer hard over soft. Another reason that couples have distinct preferences has to do with the weight of the individual. Significantly heavier people need a firmer mattress most of the time; otherwise, they can sink into the surface too deeply and get a sagging, unsupportive feeling. Extremely lighter individuals tend to need something softer that will contour to their bodies. Most customizable beds allow you to adjust how each side feels, whether it’s by specifying your settings at the factory level or physically adjusting the components when the bed arrives at your home. It’s not unusual for one person in the relationship to sleep hotter than the other. If one person in your partnership heats up at night and throws off the blankets while the other is a blanket hoarder, you may just be a prime candidate for an adjustable bed. Again, most companies allow you to specify different settings for each side, so if one of you wants a cooler surface, many companies offer the ability to customize that easily. If you’re a light sleeper and the slightest movement from your partner jars you out of a peaceful sleep, then you’ll want to look for something that has superior motion isolation. This means that when the weight shifts on one side of the bed, the other is completely unaffected. 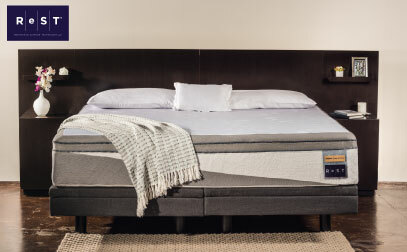 In theory, a bed that performs well in the motion transfer category should be able to absorb the motion of your partner rolling or getting in and out of bed without waking you. Most standard memory foam beds perform well, but a customizable bed can take it to a whole new level. If you buy from a company that divides the mattress into two separate pieces, there should be no motion transfer because you’ve got two separate sleeping surfaces! This is referred to as a split mattress. As time passes, the way you sleep may change. Perhaps you were a back sleeper for years, but then you got diagnosed with sleep apnea, and your doctor recommended that you sleep on your side. Or maybe you read that article about how sleeping on your side can cause face wrinkles, so you decided to become a back sleeper. 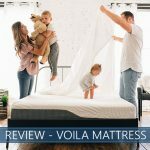 If you already bought a mattress specifically for your once favorite sleeping position, you might find that your current bed doesn’t cut it anymore if there has been a change. However, if you invest in a bed that can be flipped or adjusted easily in-home, your bed should be able to adapt to your needs. It used to be that customization didn’t come cheap. After all, it’s more expensive to make things in small batches with extras bells and whistles that accommodate each person’s unique preferences. Sometimes these beds were in the luxury bracket. However, things change, and technology and manufacturing processes improve. We’ve found several affordable brands that come in under $1,000. By cutting out the middleman and selling direct to the customer, companies have been able to continually add features while simultaneously passing the savings on to you. How do I know which firmness is right for me? There are a few factors that will help you determine the right firmness level for you. The first is your sleeping position. Exclusive side sleepers tend to need a softer surface to contour their body and relieve pressure points. Pressure points refer to the denser parts of your body, like your hips and shoulders, that press harder on the mattress. A soft mattress allows side sleepers to sink comfortably into the surface, but a firmer mattress could feel uncomfortable and could even cause numbness and tingling. Back sleepers can enjoy more of a range of firmness in their mattresses as long as their spine is well supported, but it shouldn’t be too firm that it doesn’t allow the lower back to feel comfortable. Exclusive stomach sleepers tend to need the firmest of all the mattress types to support the hip area and prevent it from sinking too deeply into the surface, which would arch the back unnaturally. As far as combination sleepers and their mattresses are concerned, something in the middle or medium-firm category tends to work very well. Is it better to sleep hot or cold? It’s best to sleep at a temperature that brings about your best rest, but there is science suggesting that a cooler room is better for you than sleeping in a hot bedroom. The logic is that our bodies cool down at night when it’s time for bed. By maintaining a temperature that’s consistent with what our bodies are telling us, we ease the burden that our internal thermostat has to deal with. That being said, if a room is either too hot or cold, it has the potential to make you uncomfortable and disrupt your sleep. Why do people wake up in the middle of the night? It’s fairly common for people to wake up in the middle of the night. This phenomenon is sometimes called “mild insomnia.” This condition occurs when you fall asleep relatively easily, but you wake up in the middle of the night for no apparent reason. This happens frequently to those with sleep apnea, and incidences of waking up in the middle of the night are sometimes also associated with old age. Other factors that could cause spontaneous waking while it’s still dark include an enlarged prostate, acid reflux, medications, and anxiety. In addition to health conditions, stress, and aging, someone’s environment could also be to blame. Loud external noises, a snoring partner, or bright lights can all disrupt sleep. Mattress companies have done an excellent job of listening to what their customers want. Price decreases, convenience, and extended trial periods have all been commonplace for years. And now, you can even customize a bed to suit your exact preferences. What will they think of next?